So I dash to the garage, dangling the trash bag away from my person to prevent splashes from whatever. There’s got to be a better way, I decided. We don’t have enough room at our vacation house in Hawaii to install an under-the-sink option. Our trash can sits on the floor near the entrance to the kitchen. What is the best kitchen trash can to buy? I Googled a few and then made a trip to Target. Yes, of all places, Target. That’s because they carry Simplehuman trash cans. I considered briefly the voice activated, but that involves batteries. I have enough work as it. Don’t need to be changing batteries, too. Several features make this type of kitchen trash can perfect. One of the biggest benefits is the J-type garbage bags that are designed to fit inside the can and under the lid. Which means the trash bag holds it shape and position. When you toss a heavy item into the bag, it doesn’t cause the bag to collapse or slide down inside the trash can. It stays put. What took them so long to design something like this? Now, I know what you’re thinking. You’re wondering how expensive are those designer trash bags that fit so neatly inside the can? They are about 30 cents each. As compared to, say, Glad trash bags for 13 gallon cans, run about 16 cents each. Or, you can figure two bags a week will cost $20 for 6 months. Twenty bucks buys 60 bags. I chose the semi-round, 45-liter Simplehuman because it cost $99 and occupies a smaller footprint in the kitchen. But it’s not just the designer trash bags that make this the best kitchen trash can. For starters, it holds 3 times as much trash as our former trash can. The step-on pedal is easy to operate but a bit too complicated for a cat to try it. Plus, get this, it automatically soft-closes. 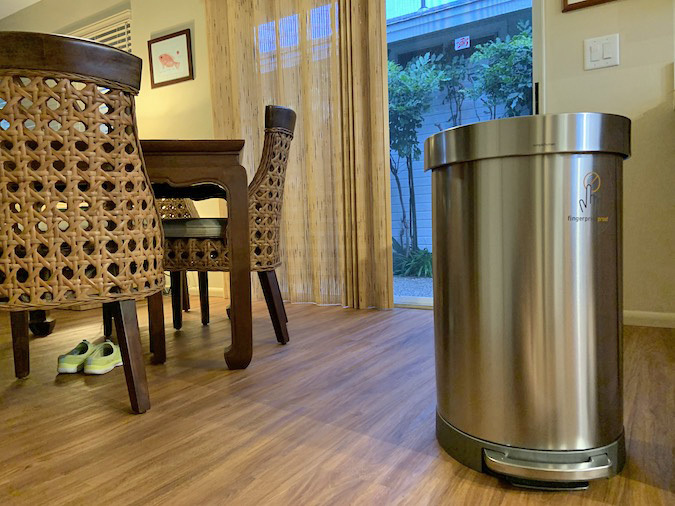 Just like my new MacBook Air, the Simplehuman trash cans come in an array of colors, even rose gold.